It may all be pretend, but graphic artists don't always have an easy time dressing their characters. 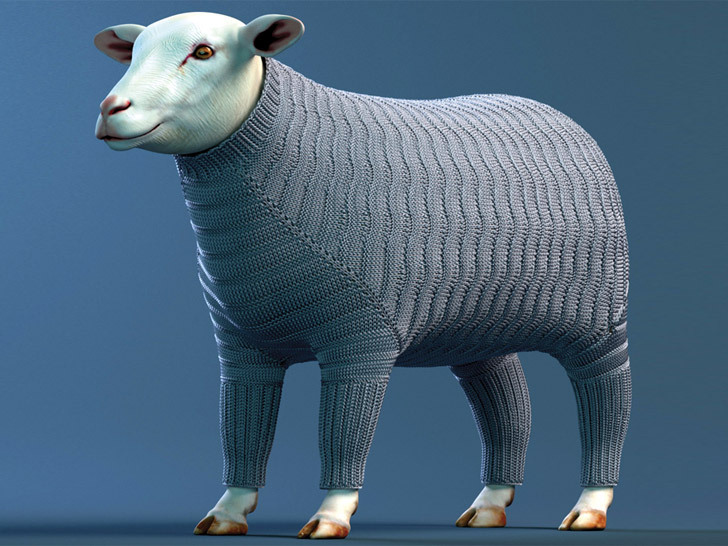 Simulating cloth by adding texture to a flat surface is one thing; replicating knitwear in a realistic fashion, particularly on a three-dimensional plane, is quite another. Scientists from Cornell University, however, have developed a new method for recreating knitted fabric out of an array of individual stitches, one that they can adjust to mimic the effects of different needles or types of yarn, as well as the style of the individual knitter. Presented at the 39th International Conference and Exhibition of Computer Graphics and Interactive Techniques earlier this month in Los Angeles, the program creates a 3D model of a single stitch before combining multiple copies into a mesh, much like tiles in a mosaic. The computer then projects the mesh onto the desired shape, treating each stitch as a tiny, flat polygon that stretches to accommodate the 3D construct. Although the technology has movie-makers in mind—Pixar is a backer—it could also prove handy for apparel and textile designers. Although the technology has movie-makers in mind—Pixar is one of the project’s financial backers—it could also prove handy for apparel and textile designers who want to experiment with looks without knitting a stitch. Using patterns from several knitting books, the researchers were able to create true-to-life images of dresses, sweaters, a shawl, and a tea cozy. There would be a real market for an application like this intended for consumer use - Ravelry is up to nearly 7 million members - and there is nothing I know of on the market right now that could serve as a mannequin with the user's own measurements to simulate the fit of a garment before it is knitted in real life. Do you have any plans to market this to individuals? Presented at the 39th International Conference and Exhibition of Computer Graphics and Interactive Techniques earlier this month in Los Angeles, the program creates a 3D model of a single stitch before combining multiple copies into a mesh, much like tiles in a mosaic. The computer then projects the mesh onto the desired shape, treating each stitch as a tiny, flat polygon that stretches to accommodate the 3D construct. Finally, the graphic image of each stitch "relaxes" to fit the shape of its polygon, just like actual knitwear would conform to the shape of the wearer. The result, according to Steve Marschner, an associate professor of computer science, is a simulation that drills down to the yarn level. Although the technology has movie-makers in mind—Pixar is one of the project's financial backers—it could also prove handy for apparel and textile designers looking to experiment with looks without knitting a stitch.